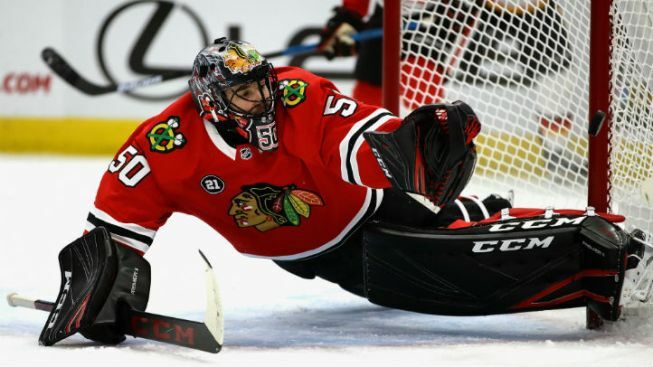 For the first time since Dec. 16, Chicago Blackhawks goaltender Corey Crawford will be on the ice as they take on the Anaheim Ducks on Wednesday night. Crawford, who has missed over two months of action because of a concussion he suffered during a game against the San Jose Sharks, was officially tabbed as the starter by head coach Jeremy Colliton after Wednesday’s morning skate in southern California. The game against the Ducks would seem to be the perfect time for Crawford to make his return, as he’s had some of his biggest successes in games against Anaheim in his career. He is 14-7-2 with a .929 save percentage and a 1.97 goals against average in those contests, and he’ll hope to add to those numbers on Wednesday. In limited action this season, Crawford has a 3.28 goals against average and a .902 save percentage in 23 games for the Blackhawks, going 6-14-2 in those games. Puck drop between the Blackhawks and Ducks is set for 9 p.m., and the game can be seen on NBC Sports Chicago Plus.